Participants prepare for their first day of workshops on Jan. 14. BASSETERRE, St. Kitts — The World Trade Organization (WTO) in collaboration with the Ministry of International Trade in St. Kitts just opened a Jan. 14 to 16, three-day workshop on Trade and Environment for the Caribbean Region under the theme “Making Trade Work for Environment, Prosperity and Resilience” to discuss the connection between environment and trade policies for Caribbean countries. 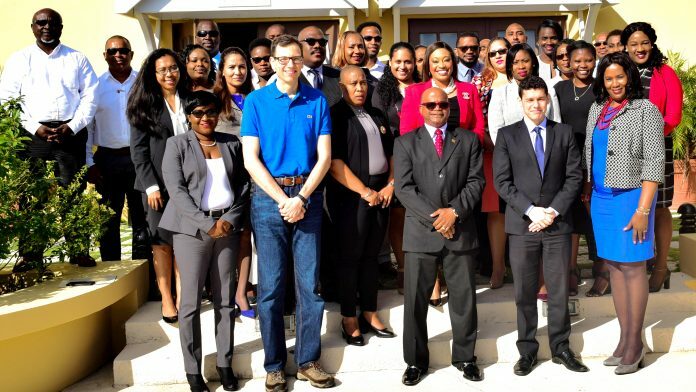 “It is hoped that participants attain a better understanding of how trade can be used as a tool to support effective environmental action such as climate change, mitigation and adaptation,” Weekes said. “A tertiary look at the today’s programme suggests that you have a very intense agenda. There is little doubt that at the end of this workshop you will all walk away even more enlightened and the objectives of this very important workshop will be realized. Workshop facilitator, Daniel Ramos, said that he was excited to be in the Federation and looked forward to a productive three days. Minister of International Trade, the Honourable Lindsay Grant, welcomed the WTO facilitators, participants and guests to the workshop. He thanked the WTO for engaging the region on “such a very timely and important subject and for choosing St. Kitts and Nevis as host for such important training exercise.